For skilled vinyl siding installers, becoming a VSI Certified Installer is easy. Get started by taking a class taught by a VSI Certified Trainer — online or in-person. Next, pass an exam that tests your knowledge about vinyl siding installation and industry recognized installation standards according to ASTM D4756. The cost of the class and exam is $175. Get started today by signing up for an online class or searching for an in-person class in your area. Do You Qualify for the VSI Certified Installer Program? To become a VSI Certified Installer, you must have at least two years of installation experience. If you have less than two years of experience, you may still participate in the program, but you will not receive your certification until you obtain the required experience. Your certification through the VSI Certified Installer Program is valid for three years. After initial certification, you must apply for recertification every three years to ensure you're up-to-date on the latest vinyl siding application techniques. Questions? Contact the Program Administrator at VSIsupport@databanque.com or 877-627-8997 for any questions on the VSI Certified Installer Program. 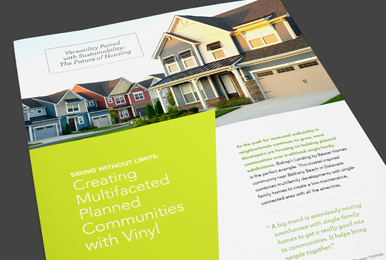 Filled with inspiration and insight, this guide on designing with vinyl siding was developed in collaboration with experienced architects, designers, builders and vinyl siding manufacturers.